Skrillex is the pseudonym used by Los Angeles, California, USA musician Sonny Moore to differentiate his electronic solo work from his work with From First To Last and his other solo projects. As Skrillex, Moore is an electronic DJ and producer boasting a musical style that incorporates electro house, fidget house, and dubstep. Moore began producing and performing under the alias Skrillex at clubs in the Los Angeles area in 2008. As Skrillex, Moore is an electronic DJ and producer boasting a musical style that incorporates electro house, fidget house, and dubstep. Moore began producing and performing under the alias Skrillex at clubs in the Los Angeles area in 2008. Throughout 2010, Skrillex became a bigger and bigger part of Moore's life. 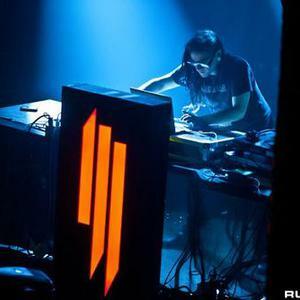 On June 7, 2010 he released his debut EP as Skrillex, My Name Is Skrillex, as a free download. Soon after, he was signed to mau5trap and began a nationwide tour with deadmau5. On October 22, 2010 he released his second EP, Scary Monsters and Nice Sprites, as a co-release through mau5trap and Big Beat. On June 2, 2011, Moore announced the release of a "Scary Monsters and Nice Sprites" remix EP titled More Monsters And Sprites, which was released on June 7, 2011 on Beatport and June 21, 2011 on iTunes. It contained 3 new tracks, as well as 4 remixes of "Scary Monsters and Nice Sprites". Skrillex announced his label OWSLA on August 17, 2011.